Our design plan is starting to take shape & my little princess couldn’t be more excited! Let’s go over a few details going into her room. 1) Two of these pendants will hang over her nightstands on either side of her bed. 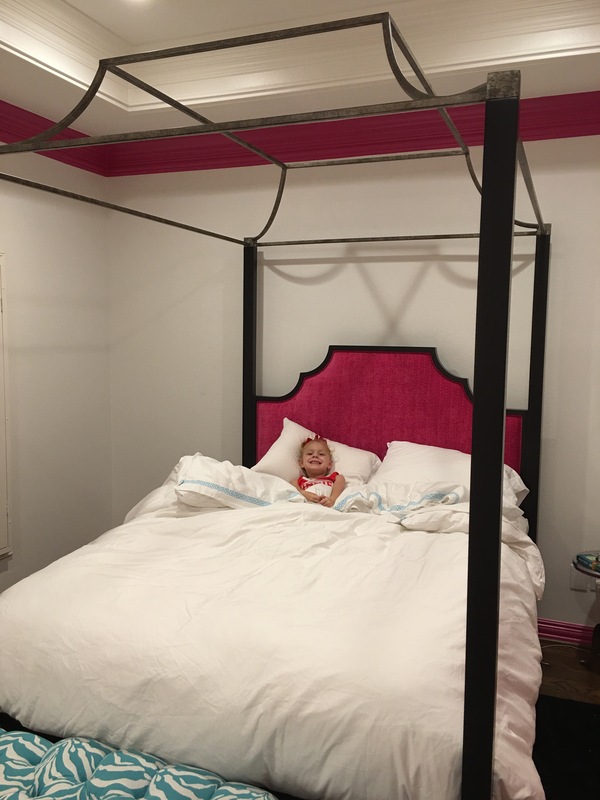 2) Brookie asked for a canopy bed so I’ve customized this bed from IBB Design in a hot pink chevron cut. The posts will all be black and the canopy will be a deep pewter. 3) This super cute Kate Spade club chair will sit by her chest of drawers & we’ll accent it with a fun bow pillow design like we did in my daughter Jaylie’s Kate Spade room. 4) The wallpaper that inspired the design! As you saw from my first post, her bathroom is covered in this adorable wallpaper. 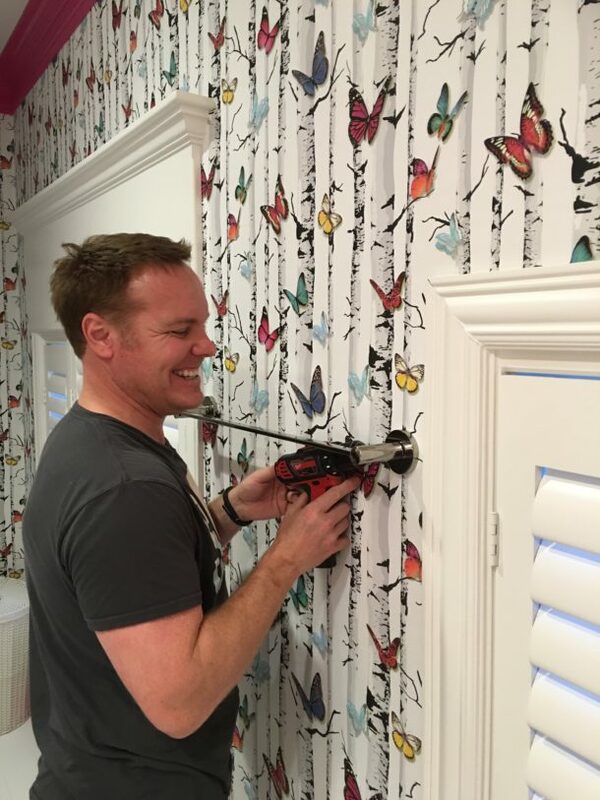 I’m having one of our artists paint large scaled butterflies strategically placed to look as if they’re flying around the bedroom. 5) This will be her chest of drawers & will be done in aqua with black tassels. 6) We carry Michael Aram at our store & I was so excited to find these butterfly knobs to use on her bathroom cabinetry. 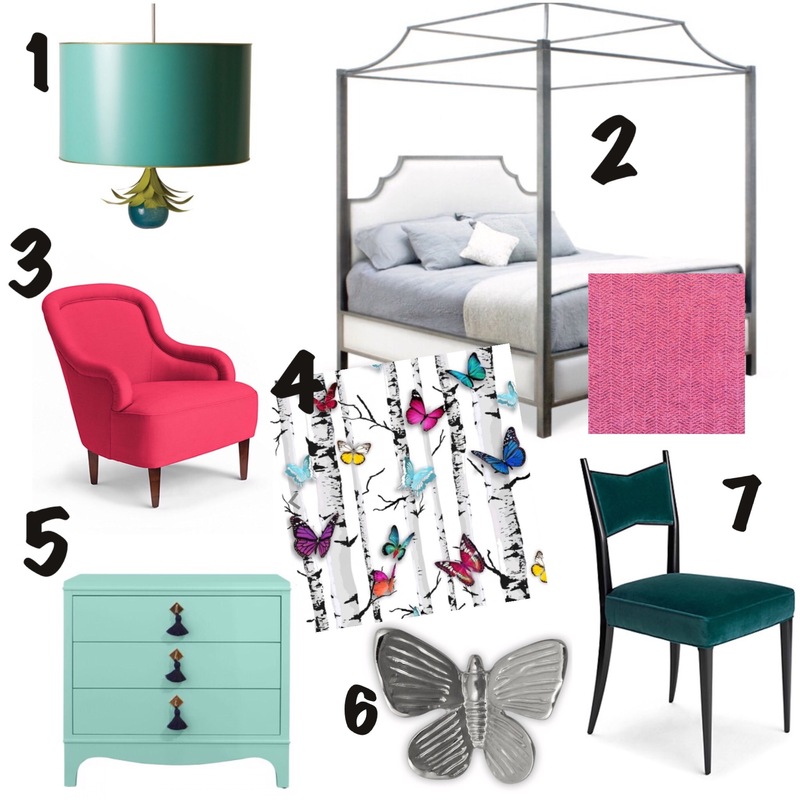 7) I’m doing Kate Spade chair as her vanity chair but in a bright aqua. Alrighty! So now you know a few more details, so let’s discuss what happened this week. 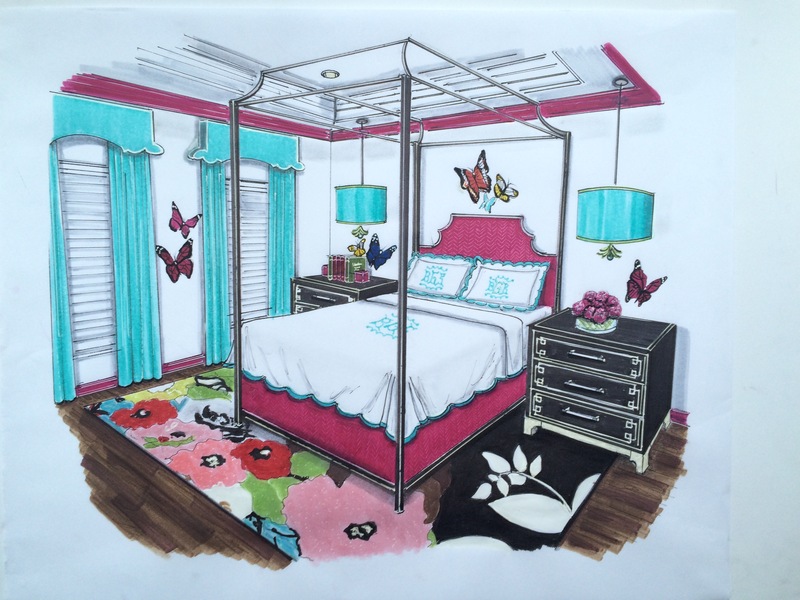 As you might have noticed from the renderings of her room design, my game plan included painting all of her crown, base, doors & trim hot pink. 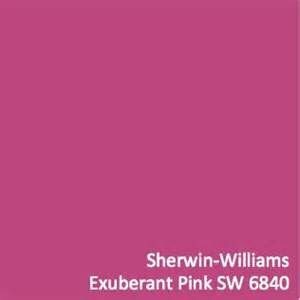 After sampling several pinks, we loved this fun bright pink. It’s name is very fitting! My handsome hubby installed all of her bathroom accessories & cabinet hardware. You may notice that I left the trim around the shutters & the shutters white. Why, you ask? 1) There is a lot going on with the wallpaper so the white gives your eye a place to rest. 2) Never paint your shutters a bold color that will be seen from the exterior of your home. Hot pink most certainly does not jive with the exterior elevation ? See how happy my little munchkin is! 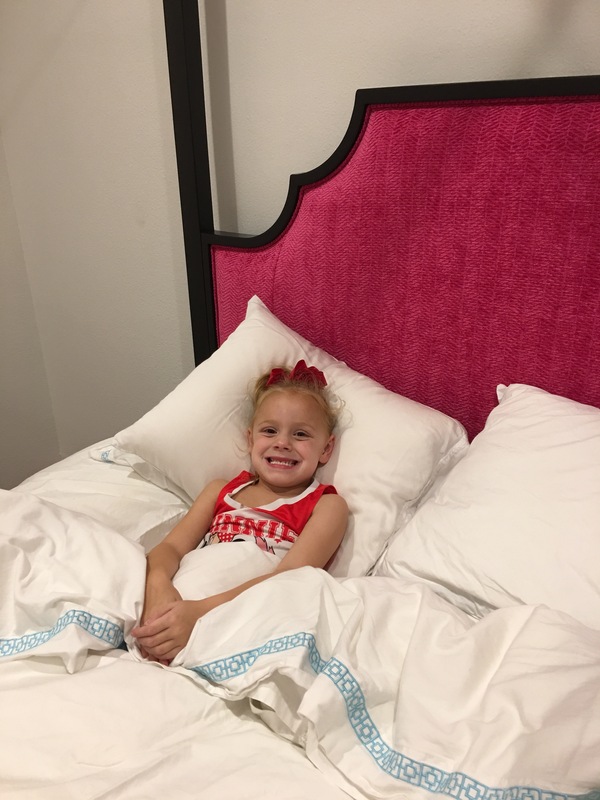 She is loving her new big girl bed! There’s a lot more to do! Follow me on Instagram for sneak peeks along the way & check back in again next Thursday for more updates.